we had a family road trip in the southern united states this summer. we visited 6 states none of us had ever been in before - tennessee, alabama, mississippi, louisiana, florida and south carolina. the others hadn't been in georgia before, but i had. and technically, i flew through miami in 1988, but that doesn't really count as being in the state. this time, we visited beaches and the state capital, so it must count. i expected to have heavy exposure to trumpanzees, but we didn't actually speak to a single one. 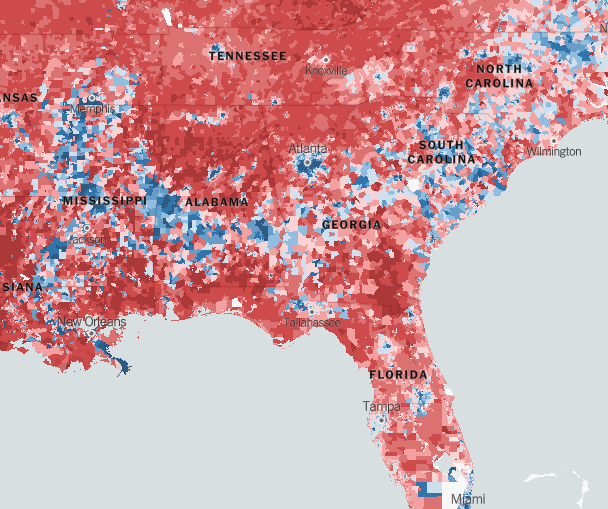 that surprised me quite a bit, but then i saw this piece in the nytimes - it seems we followed that blue route through the south, perhaps guided by some subliminal survival instinct. or maybe we just didn't really talk to enough people along the gulf coast. but we also ran into a surprising amount who vocally volunteered their embarrassment at the mangled apricot hellbeast. ~ two weeks was just the right amount of time, even tho' we did have our occasional flagging moments. at the end, i was both longing to go home and wishing we still had a few more days and that's exactly how it should be. ~ cheesecake for lunch is awesome in the moment, but come late afternoon, proves not to be such a good idea. ~ way-finding and map-reading were the biggest challenges, even in this day and age of ubiquitous gps. we didn't have a phone plan where we could roam, so we were constantly looking for wifi to help us do our route planning. in the morning, we would plan our route in google maps while on wifi and then the gps does actually follow where you are, but if you deviate from the route you planned while on wifi, the google maps app doesn't handle it well. also, husband was horrible at being the navigator if i was driving, which is weird, because he spent 18 years in the military and is otherwise good at maps. everyone stayed happier if i did the map-reading and husband did the driving. tho' even then there were a couple of kerfluffles. lesson was that maybe we should just know where we are in a general sorta way. and we did buy a big atlas of the united states. it helped out on the highways and byways, but not as much within cities. ~ several of the best things we found were quite random - a cooling creek/waterfall (mardis mill falls) on a hot alabama day, windsor ruins off the natchez trace, which we found by talking to an older couple at another point of interest along the way, and the space museum just over the louisiana-mississippi border on the way towards biloxi. ~ we actually stuck to our budget and we didn't really deny ourselves much to do so. ~ since we were five more or less adults, we needed two hotel rooms, so we were looking for rooms on the budget end, since we were mostly looking for a good night's sleep and not a place to hang out. plus, we wanted to save our money for great coffee, fun experiences and shopping in goodwill! after a few days of disappointment in the mid-range ($65-$80/night) hotels, we looked to airbnb, and we felt much, much happier. there, we found quirky places with personality, a bit more luxury and charming hardwood floors, still in our price range. if you haven't tried it, i'd be very grateful if you used this link when you do. ~ you should stay off the interstates and get onto smaller highways and byways. we did some of this, but undoubtedly not enough. when you do hit the small highways and byways, make sure you have a full tank of gas, as gas stations can be surprisingly few and far between. we stopped at one in a small town in mississippi where it was clear we were the only white people who had passed through in a long time. that made for some amusing conversations while we waited to use the bathroom. ~ shopping at goodwill is awesome and our child is a wizard at finding the best stuff there, no matter the location. 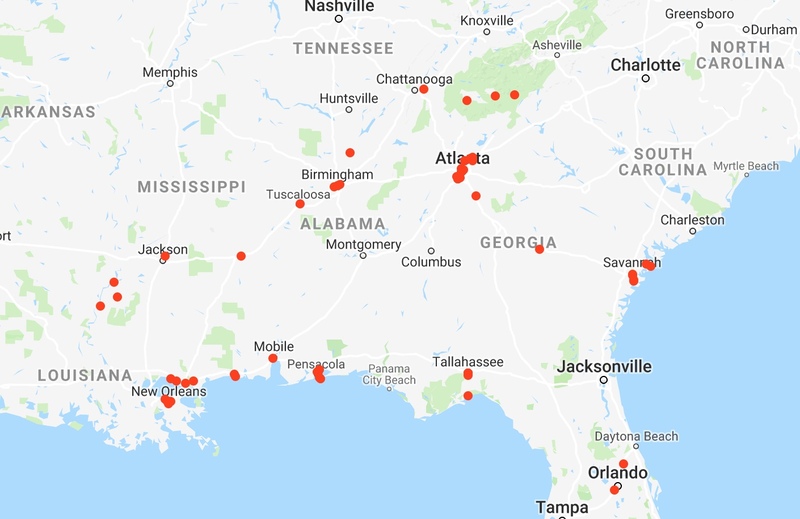 probably the best one we visited (and we tried to visit as many as we could) was the first one, south of atlanta. maybe our eyes were freshest, but i think it also had the best selection. i got an awesome t-shirt that says, "sorry i'm late, i didn't want to come." that makes me laugh. ~ there seems to be a disturbing trend in the states - one of which i was previously only peripherally aware - from barbara ehrenreichs' amazing nickle and dimed book, but never imagined i would actually encounter (which sounds more arrogant than i mean it to). when we were staying at the lower-priced hotels, it seemed like many of the other patrons were folks who seemed to be living with what they euphemistically call housing insecurity. it appeared that the hotels were full of people who probably had work, but not enough money for the deposit on an apartment, so they were forced to live on a weekly or even day-to-day basis in these hotels. i was waiting to ask for a wifi sign-in and i witnessed two young women paying their rent, peeling the fee off a roll of one dollar bills (perhaps from waitressing tips). initially, they gave the clerk, who was behind thick bullet-proof glass, since it was nearly dark, less and he said, "no, it's $63." the second girl reached down her cleavage and got a roll of her own bills out and peeled off the remainder, saying, "there goes my fun money," and rolling her eyes. i felt a little bit shocked. others stood in their doorways, smoking or chatting on the phone, obviously very at home in the hotel. it made me aware of a stark reality in my home country. and also acutely aware of my own privilege. and on that note, i'll sign off for now. more about the trip, with actual photos, tomorrow. i'm still sorting through all of them.